Many times our customers have asked how to post withholding tax in S/4HANA Cloud system (S4HC for short in the following article), it is not only because there are differences of withholding tax posting existing between traditional on-premise system (OP for short in the following article) and S4HC, but also because the Test Script doesn’t describe such cases in detail. The customer doesn’t have a clue how to post withholding tax. Like in OP world, S4HC also have two ways to post the withholding tax: during creation of the vendor invoice and during payment posting. For this article, I will talk about the vendor invoice creation process. For the withholding tax posting in supplier invoice, I will compare the OP and SHC, which helps you understand more the difference, but I will put emphasis on S4HC. Same for both system, we need to maintain the vendor master data, such record will be transferred and used when we create the supplier invoice, this is a mandatory step. 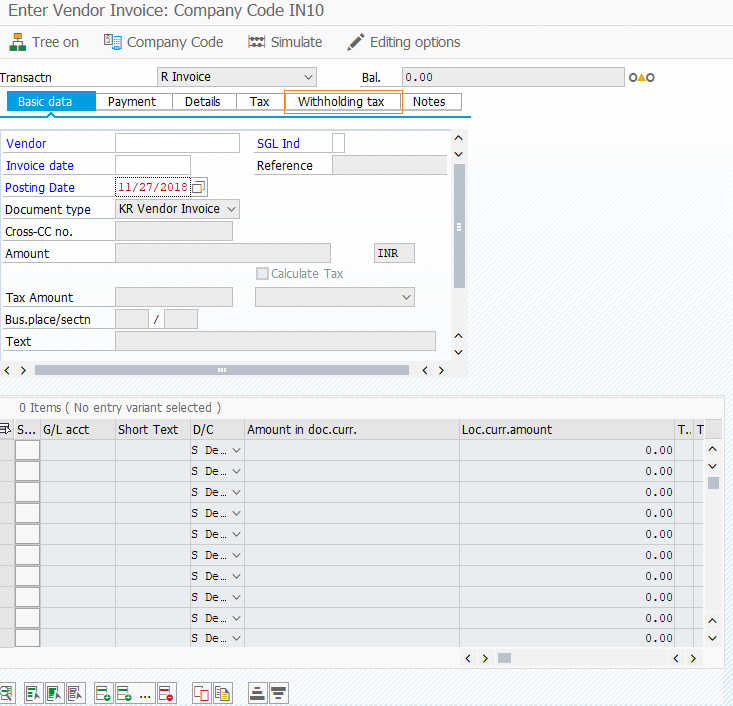 When we create supplier invoice, we use T-code FB60 in OP or “create supplier invoice” app in S4HC. In OP, the “Withholding Tax” tab always appears in the transaction window, no matter whether you have maintained the vendor master data. In S4HC, if you don’t maintain the vendor master data, the “Withholding Tax” Tab will not appear, which is one of the reasons why the customer don’t know how to post the withholding tax, simply because the tab is not there. After maintaining vendor master data, the “Withholding Tax” Tab will appear automatically when you select the vendor which contains the Withholding Tax data. Now we are going to pose the vendor invoice, after entering all the necessary data, you will see that the withholding tax type and withholding tax code are automatically filled, these data are taken from the vendor master record. If you simulate the supplier invoice, you will see that withholding tax is calculated. The system by default will use invoice amount as the base amount to calculate the withholding tax, if you have a specific amount you want to calculate the withholding tax, you can enter it in the “withholding tax base amount”, the withholding tax will be calculated accordingly. S4HC provide us the possibility of mass upload of supplier invoices through the app “Import Supplier Invoices”, can we also use the app to post withholding tax instead of creating one by one? The answer is yes! And you can click on the single line to review and change data before Posting. In conclusion, you can post withholding tax by creating supplier invoices manually or using the mass upload functionality, before that, you need to make sure you have maintained the Vendor master data.